Let’s face it. We hate spending money on things we think we can do ourselves. Maybe you feel that way about investing. Why should you pay a financial advisor when you could manage your money yourself? There is a lot of secondhand information floating around about financial advisors. People tend to cringe at the fees, or they think they’ll be cutting a check at the first meeting. So, when it comes to investing, some people say, “I can handle it all on my own.” But let me ask you this: Do you fix your own air conditioner? Build your own computer? Fly your own plane? Yeah, me neither. You use a professional because they have more education and experience. You know they’ll do the job right. And that gives you peace of mind. The same applies with your finances. You need a pro in your corner. Here’s why. What Is a Financial Advisor, Exactly? Certified Public Accountant (CPA) — These folks have to pass a rigorous exam to be certified. They can help you with taxes, business services (like mergers and acquisitions), consulting and accounting, of course. Personal Finance Specialist (PFS) — These people are CPAs who have passed even more exams and have gained extensive education and experience. They can help you with broader financial planning, not just accounting. Registered Investment Advisor (RIA) — These advisors specialize in managing the assets of people who have a high net worth. They also work on behalf of endowment funds, commercial banks, mutual funds, hedge funds, and insurance companies to help those businesses make more money. Certified Financial Planner (CFP) — These individuals also have to pass an exam to earn certification. Plus, they must have work experience and agree to a code of ethics. Their expertise includes taxes, estate planning, insurance and retirement planning. Chartered Financial Analyst (CFA) — These folks must take three exams and have three years of experience in their field. They focus on stock analysis for banks, mutual funds, and other big institutions—not financial planning for individuals. Now, financial advisors can have more than one license. For example, a Certified Public Accountant (CPA) can also be a Certified Financial Planner (CFP). I know, it gets confusing with all the abbreviations. But the gist is this: Work with someone who has training and experience. Don’t trust your uncle’s cousin or an old college “buddy” you kind of knew for help with your investments. Because they keep you on track with your investing plan. Because they do more than invest your money. Because even the pros need help. Because you don’t have the time. Because you’re an emotional creature. Let’s take a closer look at these reasons. You’ll discover that financial advisors are more important than you thought! How much money should you have saved for retirement at your current age? How can you make up for lost time if you started investing late? Should you change your investing portfolio as you get older? While answering these questions may seem like quantum physics for you, they’re like preschool math for a financial advisor! And because they know how to work the math, they can keep you on track in saving for retirement. In fact, a study from John Hancock showed that 70% of those who work with a financial advisor are on track or ahead in saving for retirement, compared to just 33% of those who don’t use an advisor. (1) Seventy percent is a whole lot better than 33%! Rebalancing your investments. Your portfolio is probably made up of different kinds of investments—mutual funds, bonds, cash equivalents—and those investments equal 100% of your money. For instance, you may have 50% of your money in mutual funds and the other 50% in bonds or cash. Over time as you get closer to retiring, you may want to change the percentages to protect your wealth. A financial advisor can give you advice on when and how to change those percentages. Tax planning. Do you know what tax laws apply to your financial situation? Or which investment will be taxed the most? 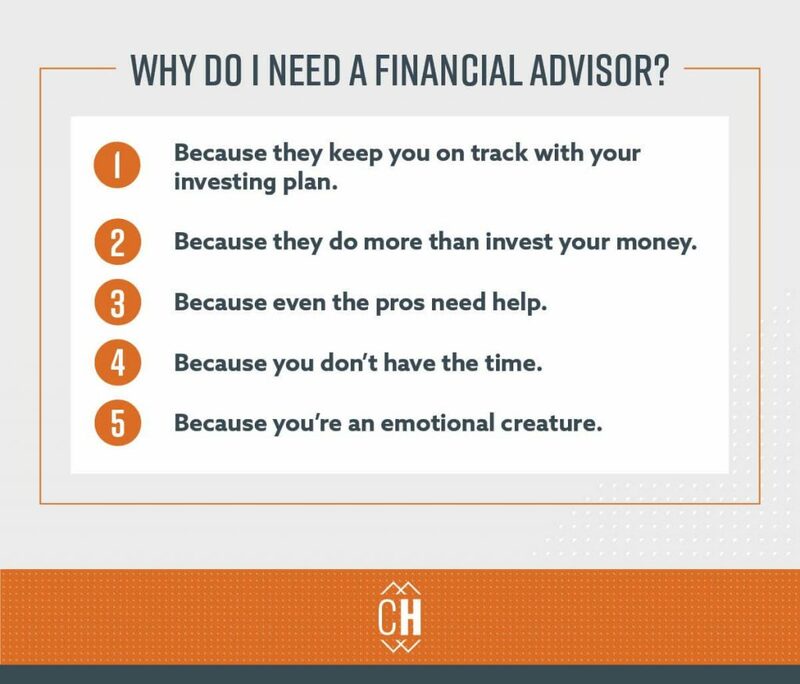 A financial advisor will know the answers to those questions. They know which of your assets will have the most impact on your taxes, when those taxes are due, and how much will be owed. Advisors help you stay on good terms with Uncle Sam! Estate planning. As you build wealth, one of your tasks is to decide where that money would go if something bad should happen to you. Your financial advisor can work with an estate attorney to make sure your assets are distributed according to your instructions, not based on some random probate court. Long-term care planning. One of the biggest expenses you may incur in retirement is long-term care. If you need in-home medical care or if you stay in a rehab hospital while you recover from surgery, you could burn through your retirement fund more quickly than you realize. A financial advisor can help you make the best decisions in this area of planning. Spending strategies. When you retire, which of your investments will require a minimum withdrawal every year? Which income stream should you tap first? Questions like these are critical when you start using the money you’ve been saving. A financial advisor can help you make the best decisions in this area. Doctors don’t perform surgery on themselves. Dentists don’t pull their own teeth. Experts in any given field get advice and consultations from others they respect. And that’s true in the world of financial planning, too. That’s because everybody has blind spots. You know what I’m talking about. When you’re driving, there’s that one spot in your car that blocks your line of sight. And that can cause accidents if you change lanes too quickly. You have blind spots in managing your wealth, too. For some, it’s emotions. For others, it’s misinformation. And those blind spots can cause big mistakes in your financial planning. That’s why you need a financial advisor. A pro can give you a 360-degree, bird’s-eye view of your financial situation because they’re on the outside looking in. They can spot weak areas you may be blind to and give you advice on how to fix them. They can keep a cool head when you panic, and they can give you educated advice on making wise money moves. Even the best of the best need expert help. So do you. Think about your typical workday. You’re crazy busy from the time you wake up until you hit the pillow at night, aren’t you? Let me ask you an honest question: Do you really think you can put in the hours of research it takes to choose the right mutual funds or find the right balance of those funds? Fidelity surveyed its program participants, and 77% of them admitted that they didn’t have the time or knowledge to be confident in their investment choices. (3) My guess is they’re not alone. And even if I had the time, I would much rather spend it with my family. An afternoon tossing around the football with my boys beats pouring over thousands of numbers. Every time. Professional advisors are elbow-deep in investing all day, every day. While you might spend hours looking up definitions, figuring out acronyms, and trying to decipher reports, these folks won’t. They know their stuff. They can find the answers in half the time because it’s the world they live in. They can save you countless hours that you just can’t get back—time you’d rather spend elsewhere. Listen to me people: When the stock market takes a huge drop—like it did with the financial crisis of 2008—your stomach will start churning. Why? Because you’ve got some skin in the game! You know that those drops in the market mean a drop in your portfolio. You feel like your money is disappearing right before your eyes—and nobody invests their hard-earned money just to lose it! If you don’t work with a financial advisor who can remind you that the market will go back up (because it always has), your emotions could take over your logic and cause you to make some stupid decisions—like pull out all your money and hide it under a mattress. A good investment advisor knows that market dips are like getting stocks on sale! They’ll strongly encourage you to leave your investments alone—and to invest some extra money while you can get the stocks at a lower price. Likewise, when a stock or new investing fad is soaring, an advisor will help you keep a balanced portfolio and not turn your retirement outlook into a roulette wheel in Vegas. That’s why you need an advisor. Feelings are real, but they don’t always tell you the truth. When Should I Meet With a Financial Advisor? Now, these are some situations in which you need a specific meeting with a financial advisor, but these aren’t the only ones. If you think you might need help, all it takes to get started is a phone call to an advisor you trust. If you’ve never met with a financial advisor before, you might feel intimidated. And you might not know what questions to ask. I’ve been there. But don’t let that stop you from getting help. To start the process, just ask around. Folks who like their advisors are often more than willing to spread the love. Now, keep in mind that you don’t have to work with the first person you meet. Talk to a few, ask them questions, and then choose which person is right for you. What’s your educational background? What specialized certifications have you earned? How long have you been an advisor? Could you give me three clients’ names, phone numbers and email addresses as references? What services can you provide? What’s your favorite aspect of your job? What is the smallest, average, and biggest portfolio you work with? How much do you charge for your service? Do you offer different levels of service? How often would you evaluate my financial situation and provide an up-to-date forecast? Once you’ve chosen the person you want to work with, you’ll set up another appointment. At that meeting, you’ll go over your current financial situation. You’ll talk about any retirement accounts you have, like IRAs or Roth 401(k)s. If you have kids, you may talk about when and if you want to save for their college funds. You’ll talk about your long-term financial goals. And then you’ll work together to create a game plan for reaching those goals. But it all starts with you. Your financial future is in your hands. And if you don’t take control of your money now, then when? It’s time for action! Find a SmartVestor Pro in Your Area Today! If you want to go from being an investing rookie to the CEO of your retirement, find the right people to help you. Just enter your information, and you’ll get a list of SmartVestor pros in your area.